Delivers the great acoustic tone of studio miking in a versatile preamp. 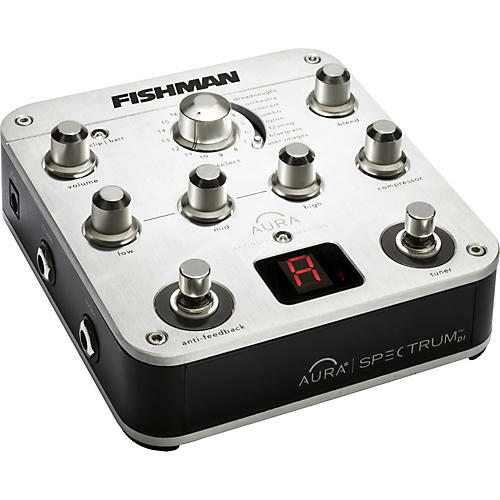 The Fishman Aura Spectrum DI is a complete, professional all-in-one solution for the performing musician. Award-winning Aura technology restores a studio-miked sound to your undersaddle or soundhole pickup. Housed in a professional-quality direct box with features like 3-band EQ, a one-knob compressor, and Automatic Feedback Suppression, the Fishman Aura Spectrum DI delivers world-class acoustic tone on stage or in the studio. Fishman Aura preamps and onboard imaging systems go beyond modeling to create a spacious sound that is both vivid and natural. The sound of your acoustic instrument in a room is a combination of time, space and distance, that's why no matter how great your undersaddle pickup or soundhole microphone sounds (and they can sound fantastic), there is still something missing - the instrument's aura. To recreate the sound that naturally surrounds your instrument in a room through an amplifier or PA, Fishman created Aura imaging technology. Using a selection of the most coveted microphones and Fishman's Aura algorithms, they developed a library of images that when blended with the pickup sound on your guitar, create a dramatic, natural sound. All Aura products come loaded with a selection of images. And depending on the device, your Aura is pre-loaded with a selection of images that correspond to your specific guitar model or are a "greatest hits" from Fishman's Aura image library. As an Aura owner, you can download images from the image library at Fishman's website to customize your Aura to match your own performance requirements. Fishman's Aura Image Gallery software is a PC/Mac-compatible application that allows users to access images for hundreds of guitar makes and models through their free Aura image library. Once installed on your PC or Mac, the software also allows Aura images to be sorted, managed, and grouped. You can then take advantage of the preamp's open architecture by loading Aura images via a USB cable. Adjust your acoustic atone to professional quality with the Aura Spectrum—add it to the cart now.